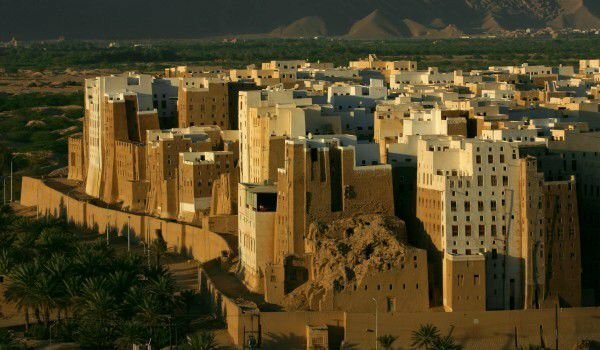 Shibam is an ancient Arab city, which can be described as the oldest settlement on the planet with skyscrapers. This, of course, is an exaggeration, because the high buildings and towers of Shibam did not reach 40 meters, but for the time in which they were built these dimensions are unique and without parallel. Not surprisingly, it is inflected as "Manhattan of the desert". Shibam is actually an old gated Arab town and similar settlements were built in Africa. If you look at the whale from a distance, you will see nearby countless elongated and rectangular towers. All are dotted with small windows. The old village is located in Wadi Hadhramaut region of Yemen. Since 1982, it is included in the list of World Heritage Sites by UNESCO. And today Shibam is an inhabited city with about 7 000 inhabitants. Through the narrow streets it is not possible to drive a car, so it is rare to see a car. The narrow medieval alleys, surrounded by dense clay houses have all the charm of the Orient. Shibam is a quiet city, dusty and smelling of animal feces everywhere, but this is hardly the most important factor here in the former capital of the Hadramawt Kingdom. To this day Shibam can be accessed through a single main entrance, which interrupts the high fortified walls of the village. The old city is visible from afar on the road to it, and depending on what time of day, the buildings are stained in different colors. Morning clay, crowded multi towers of Shibam are yellow, can be painted in ocher and beige, and at night often show off pink shades. This color is also known by the name "Al-Saffra", which translates as "yellow". It has an old and new district, which occupies an area of 1117 sq km and has about 48 000 inhabitants. Long ago in the ancient village lived about 7000 people, but over time they moved into the new area or moved to other cities. This in turn led to the abandonment of many buildings that are subject to weather and climate impacts. By its nature and significance Shibam is the earliest example of planning based on vertical structures. Absolutely all buildings, houses and towers in the old town were built of adobe and clay at the time when on these lands Bedouins attacked settlements. That is why most tower-houses which are about 500 in number, were built five or sixteen floors. On each floor there are usually 2 apartments. So the attacks of Bedouins were weakened. A significant part of the buildings in Shibam date from the 16th century, but in the last few centuries they have been restored. Shibam boasts some of the highest towers in the world entirely built it adobe. Several of the buildings reach 40 meters. Record holder in the medieval Arab village is the adobe minaret that reaches 53 meters. It is covered with a protective compound that aims to protect it from the influences of nature and time.